MainAll NewsEuropeCan Holocaust education combat antisemitism? Can Holocaust education combat antisemitism? 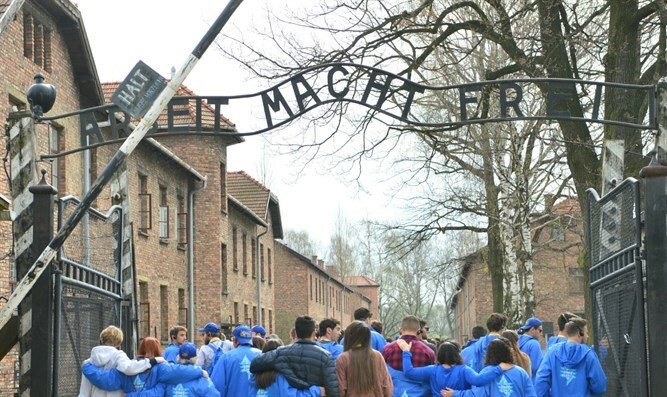 At the annual European Jewish Association conference in Brussels, Arutz Sheva interviews Michel Gourary, Director of the European March of the Living Network, as to the efficacy of Holocaust education as a tool for battling antisemitism. When asked about whether learning about the Holocaust and knowing the story really help Gourary responded; "Absolutely. Our focus is among the younger generation. We're bringing a lot of teenagers from high schools. For example, from Austria alone we brought in 11,000 young people, who are not Jewish, to visits the camps and to participate in the educational program of the March of the Living"
These young people then act ambassadors to others. Gourary continued "Those eleven thousand can reach out to their families, their peer group, and that's exactly what we're looking for; to enlarge the group of European citizens concerned with what happened during the Holocaust and what has to be done to avoid tragedies like this." In order to maximize impact and ensure that the blunt trauma of seeing the camps doesn't lead to suppression of the lessons learned the program takes a more comprehensive approach. "We start the program a year before and we continue it a year after. For example, we have in Lithuania, on behalf of the March of the Living Network, we will have a conference of Holocaust teachers to discuss the impact on the young generation and from that point to engage them to be more proactive. So we are absolutely discussing how to do it in a more appropriate way"
Those impacted by the program will "help us actively monitor and counter antisemitism, racism and xenophobia".